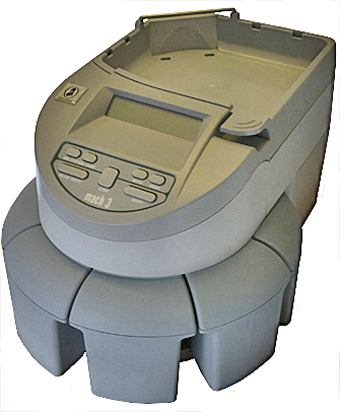 The Mach® 3 is a versatile, cost-efficient, compact coin processor that simplifies and speeds coin processing for any business that counts, sorts or packages coin by hand. The simplicity of the patented Figure 8 technology provides optimal and accurate counting and sorting at 1,500 coins per minute (CPM). This makes the Mach 3 one of the fastest in its class. Coins can be sorted into drawers, bags or tubes for rolling. A standard drawer can be used for processing only a few coins of one denomination. A bagging attachment limits the number of times a user needs to stop the count process allowing large amounts of different denominations to be processed quickly and easily. The compact design of the Mach 3 and the optional carrying case make it easy to transport between locations. If space is at a premium, the Mach 3 easily stores under the counter and out of the way until it is needed.